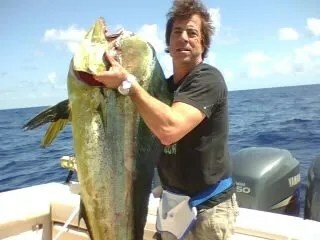 Home / Fishing Reports / Record Mahi Caught with Capt Chris !! With summer in full swing, on a calm, flat, and beautiful day, this gorgeous 53 lb mahi was caught with Capt Chris trolling big lures on a very productive current rip ! Not many fish this big are caught and we were lucky enough to get em! !